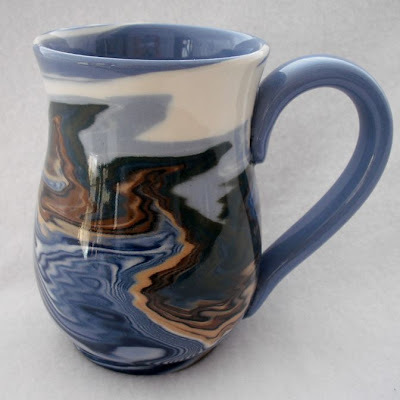 As a potter, I take a little bit of the earth and make something useful that displays earth imagery. 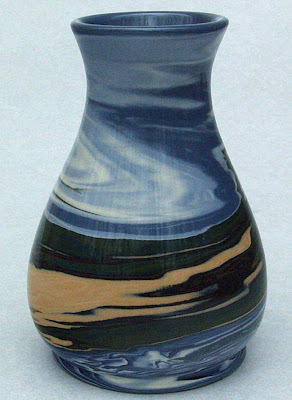 For the past 28 years I have primarily used one set of techniques to do this: neriage/nerikomi/agateware. My interest in these techniques was first sparked by an exhibition of work by Ban Kajitani shown at a gallery in Naperville, IL in 1983. Most examples of thrown neriage/nerikomi/agateware feature random spiraling designs of colored clay. My pieces are unique in that their designs are non-random and non-spiraling. Instead I layer the clay to reflect the patterns of land, water and sky. Recently I have been developing some new ways of creating patterns in clay through a unique variation in this process — a variation that uses an unthrown assemblage of colored clays to create highly-detailed designs. I mostly use this process in my jewelry-making, creating striking images on earrings, pendants, and pins. To create the colors I need for the landscape patterns, I start with white medium-fire porcelain clay bodies, add pigments made of metallic oxides or stains. The various pigmented clays are individually wedged until their moisture content is as close as possible. I use 4 to 20 lbs. of each color to create about 800 lbs. of layered clay. The patterns and shading of the landscape design require about 300 different layers of about 60 colors. A portion of the layered clay is then centered on my potter's wheel, where it is formed into a piece of functional ware. For the colored patterns to become visible, the surface of the dried piece must be cleaned of all slip and smears of clay. This trimming and scraping is also done on the potter's wheel. After the piece is completely dry, it is bisque fired. Smears or rough spots are removed by sanding. 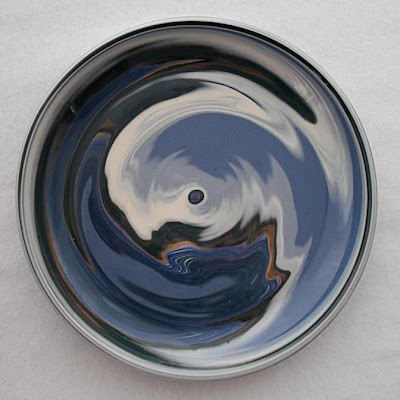 Then the piece is dipped in a clear, lead-free glaze and refired. 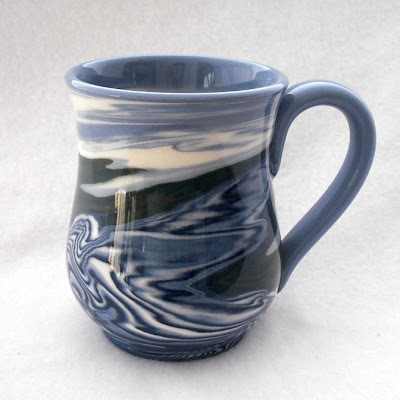 A finished piece displays images of water, waves, beach, shoreline, rocks, foliage, and a cloud-filled sky. These complex designs develop both before and during the forming of each piece. Their appearance is influenced by the placement of the different clay layers, and the amount of wedging (mixing), cutting, and other manipulations. More variations can arise depending on my choice of forming and shaping techniques. Neriage/nerikomi/agateware has allowed me to integrate the decorative and formative process. Forms that appear soft and fluid as the clay is being shaped become hard and rigid after firing — and so a lump of wet clay from the earth becomes an earth-patterned vessel used to hold food or drink. Just as we get our sustenance from the earth, we can get our sustenance from this little piece of reshaped earth. Within the context of utilitarian forms, I am thus able to unify beauty and utility.